BK-900 "Burgermeister Rex" -- clearly this creation is the byproduct of what happens when I'm brainstorming what to build next, and I suddenly get really hungry. In all truthfulness, on one weekend afternoon I sat and pondered what sort of whimsical thing to build, when I realized I hadn't eaten all day. 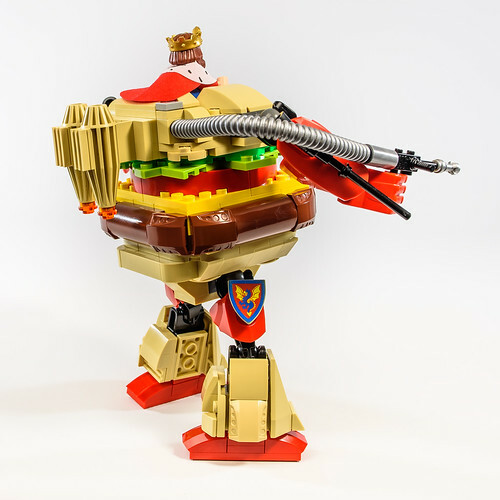 I then came up with the idea of the iconic Burger King "King" piloting a bipedal mechwarrior Whopper! The construction was rather streamlined and straightforward, with many of the design aspects borrowed from last year's Mecha Mouse. The only real challenge was in the brainstorming phase when I was considering building a rival McDonald's mech unit, but alas didn't want to spend $20 on a custom-printed Ronald McDonald minifigure from eBay. Maybe I'll just build a Colonel Sanders one next instead. Fact: during construction, I actually took a break and went to my nearest Burger King for lunch and inspiration. I ate four regular burgers, a large order of fries, and 20 chicken nuggets. Fact: I have a severe food intolerance for mayonnaise, which means I'm unable to eat a Whopper anyway. This is why I only eat plain hamburgers with nothing but ketchup.